As a new generalization of Pawlak rough set, the theory and applications of rough set over two universes has brought the attention by many scholars in various areas. In this paper, we propose a new model of probabilistic fuzzy rough set by introducing the probability measure to the fuzzy compatibility approximation space over two universes. 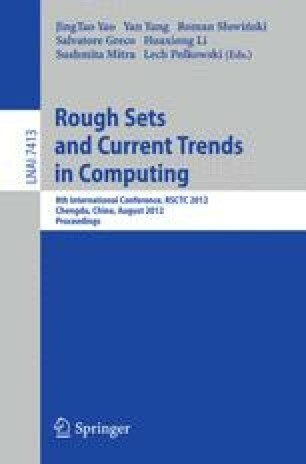 That is, the model defined in this paper included both of probabilistic rough set and fuzzy rough set over two universes. The probabilistic fuzzy rough lower and upper approximation operators of any subset were defined by the concept of the fuzzy compatible relation between two different universes. Since there has two parameters in the lower and upper approximations, we also give other definitions for probabilistic fuzzy rough set model under the framework of two universes with different combination of the parameters. Furthermore, we discuss the properties for the established model in detail and present several valuable conclusions. The results show that this model has more extensively applied fields.